Size is 12x12in 4P ( 30x30cm 4P), total 4 panels, framed and ready to hang. HD canvas printing artwork by using a high quality mirrored gallery wrapping technique which extends the picture all the way around the wooden frame. This creates an immersive 3D effect and makes the printed artwork look great without adding an expensive additional frame. And metal hanging hook(s) already nailed on frame the canvas art is ready to hang out of the box. If this canvas art set arrives damaged for some reason, we will replace or refund it. If you are not satisfied and wanna return the canvas for whatever reason in 30 days after receipt, we accept it and return your payment. 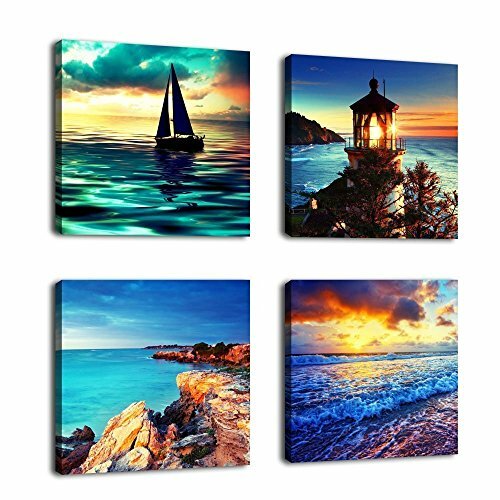 Due to different monitors, actual wall art canvas prints colors may be slightly different from the product picture shown online.